She blogs at wild shores of singapore and runs the wildsingapore website which includes wildsingapore news and wildsingapore happenings and an online guide to Singapore’s common marine life. She has more than 50,000 photos on wildsingapore flickr for free download. She started TeamSeagrass and volunteers with the Mega Marine Survey of Singapore in collaboration with NParks. She was involved in setting up the guiding system at Chek Jawa and Pulau Semakau and trained volunteer guides at the Sisters Islands Marine Park. She is also part of the Friends of Ubin Network and organised Ubin Day 2014 and Ubin Day 2015. She volunteers as a nature guide with the Naked Hermit Crabs. She is also an associate of the Lee Kong Chian Natural History Museum of Singapore. She is co-author of the Chek Jawa Guidebook and the Wild Singapore coffee table book. 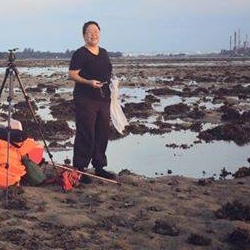 She recently produced the Singapore Shores guidesheet and is currently working on new marine nature guidebooks for Singapore. More about wildsingapore and Ria’s projects. Eugene Tay is a sustainability advocate who believes in spreading the environmental message, and inspiring and empowering others to take action. He is the Director of Green Future Solutions, a sustainability consulting company that helps businesses and organisations address environmental challenges and identify green opportunities. He guides companies and organisations along their sustainability journey, and helps them on: Strategy and Operations; Research and Content; and Education and Training. Eugene is dedicated to ending waste in Singapore and is the Executive Director of Zero Waste SG, a new non-governmental organisation dedicated to help Singapore accelerate the shift towards zero waste and the circular economy. 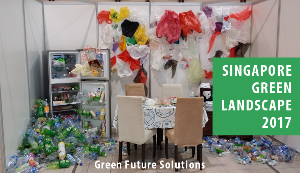 Zero Waste SG aims to promote education and engagement on the 3Rs (Reduce, Reuse and Recycle) among individuals and households; increase waste minimisation and recycling among businesses and organisations; and reduce specific waste. 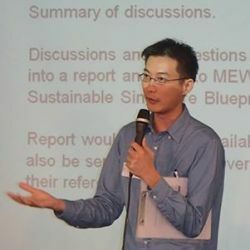 Eugene is also the Co-Founder of Circular Economy Singapore, the President of the Sharing Economy Association (Singapore), and manages the Green Corridor campaign. November Tan is an environmental geographer by training, urban planner by profession and a nature volunteer by volition. She is the Founder of The Leafmonkey Workshop, which works with nature volunteers on scientific communication. She did her Master in Social Sciences in geography, researching on Singapore’s ecological footprint through the Singapore-Cameron Highlands’ vegetable trade. 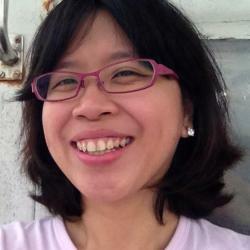 She is also the curator of Pulau Ubin Stories and author of the Midnight Monkey Monitor blog. For the past 6 years, she has researched and written on liveable cities and urban green spaces, as well as putting theories to practice as an urban planner. Marcus Tay is an environmental engineering graduate who gets a dose of the wild nature side, thanks to the NUS Toddycats. He first enjoyed himself working at Shanghai Roots and Shoots between 2006 to 2007, developing the Eco Office Program and Organic Garden for schools. Subsequently, his work at the NUS Office of Environmental Sustainability allowed him to find success in tackling recycling contamination. Currently, he is IKEA Tampines’ Sustainability Manager, overlooking the store’s environmental impact, charitable work and most importantly, steering the sale of More Sustainable Life@Home products. 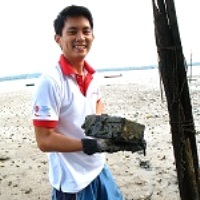 Marcus was also an active volunteer with International Coastal Cleanup Singapore for 9 years where he made like minded friends who worked together efficiently to deliver a logistical event with the barest of resources. Marcus happens to be the inaugural winner of the Mediacorp Saving Gaia challenge. Pls submit the application form to eugene@greenfuture.sg by 10 Jan 2016 (closing date is now extended to 24 Jan). We regret that only shortlisted applicants will be notified for an interview. Hi Eugene! 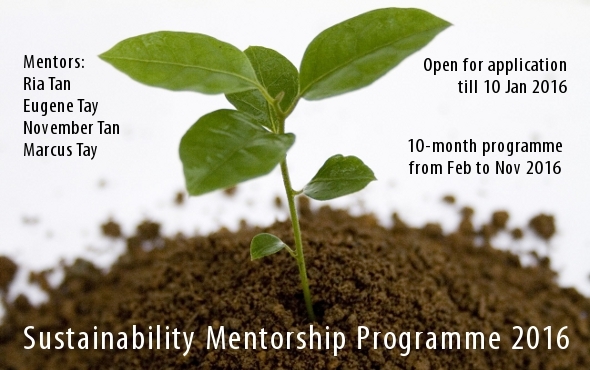 I would like to be added on your mailing list (if you have one) for 2017’s Sustainability Mentorship Programme. Also interested to know what other sustainable / green initiatives this group does and possibly take part in them. Looking forward to getting in contact with you. Thank you!